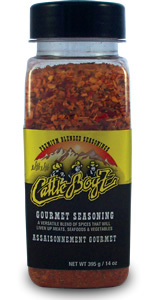 Cattle Boyz was developed by beef ranchers in Alberta, Canada. As people who appreciated quality meat, the Ternes family wanted to create a sauce that would compliment the beef that they raised. They started with their original BBQ sauce and eventually expanded into a full line of sauces and rubs. In 1998, Cattle Boyz officially hit the Canadian marketplace. They've since expanded throughout North America. Cattle Boyz sent an assortment of products to be reviewed. The first product I had a chance to use was their Gourmet Seasoning. Cattle Boyz Gourmet Seasoning is an all purpose seasoning. It's a mild salt, sugar and garlic blend that can be used for a variety of meats and vegetables. The Gourmet seasoning comes packaged in a large, 14 oz shaker. The seasoning is a mix of fine and coarsely ground spices. One Issue that I had with the shaker was that some of the spices were too large to fit through the holes. It really limited how quickly the seasoning could be poured onto the meat. I used the seasoning on grilled chicken, smoked chicken and potatoes. It worked well with all three dishes. It's versatile enough to use with just about anything. The flavors are salty and mild. It makes an excellent alternative to regular table salt. The best use that I found for the Gourmet Seasoning was on whole smoked chicken. The seasoning made the crisp chicken skin ridiculously good. Any occasion that typically calls for salt and pepper can use the extra boost provided by Cattle Boyz Gourmet Seasoning. For more information about Cattle Boyz products click the title of this review. See how their Gourmet Seasoning compares to other products on the "Product Reviews" page. 0 Response to "Cattle Boyz Gourmet Seasoning"